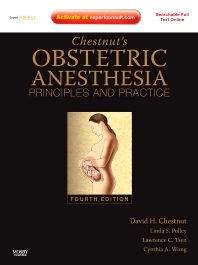 The updated fourth edition of this comprehensive, highly respected reference covers all you need to know about obstetric anesthesia—from basic science to various anesthesia techniques to complications. The editorial team of leading authorities in the field now features Drs. Linda S. Polley, Lawrence C. Tsen, and Cynthia A. Wong and presents the latest on anesthesia techniques for labor and delivery and medical disorders that occur during pregnancy. This edition features two new chapters and rewritten versions of key chapters such as Epidural and Spinal Analgesia and Anesthesia. And, Expert Consult functionality allows you to access the entire contents of the book online.